Foreign students who have the chance to study at Charles University under the Erasmus+ program often describe their semester or two in Prague as “unforgettable”. Not only is Erasmus+ an opportunity to advance in one’s chosen major but it’s a chance to experience something different in the heart of Europe. This time, however, we were interested in finding out more about dorm life than the results of one’s studies. I met with two students from Latvia who live at Větrňík, a block of dorms located in Petřiny – a quiet, leafy district of Prague. They told me more about what living there is like. Erasmus+ students and roommates at Charles University Ieva Murniece and Alina Dunajeva (in foreground). Photo: René Volfík. It is a bitter cold evening when I set out for the block of dorms located along a line of bus and tram routes. Dusk has fallen quickly and many of the local pre-fab apartments are partly cast in shadow; unlike regular apartment blocks, the dorms are easily recognisable from a distance: row after row of windows of either uninspired brownish-orange or blue or other cheap curtains rimmed by fluorescent light that bleeds through into the night. I search for the entrance where I meet Ieva Murniece and Alina Dunajeva (students of Philosophy and Russian Philology, respectively), who have known each other for a couple months now since catching the same bus from Riga. After introducing themselves, Ieva continues. Since both come from Latvia it’s not surprising they often talk in their native tongue, Ieva adds. 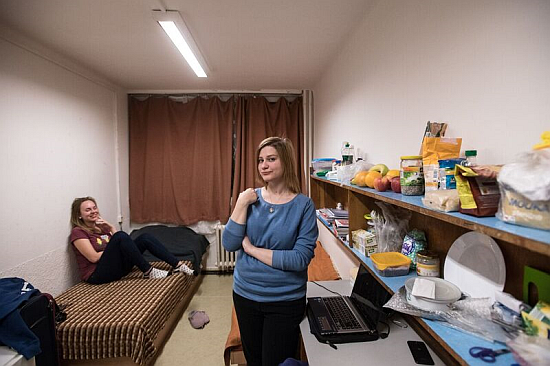 When the girls first moved into their room at the dorm in Petřiny, they were, however, somewhat at a loss for words. Although they had some idea of what to expect, the reality was a little different, says Ieva with a laugh. 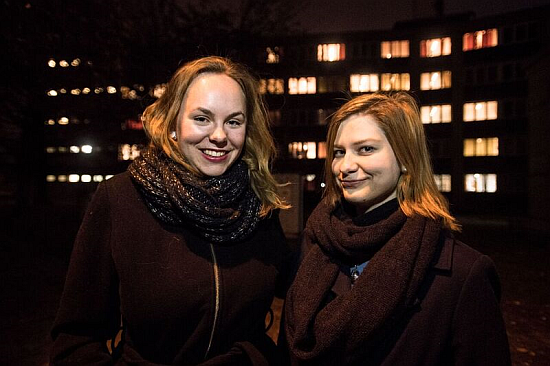 Home, sweet, temporary home: Roommates at Charles University Ieva Murniece (left) and Alina Dunajeva . Photo: René Volfík. They explain that upon entering the room for the first time they found it “a bit smaller than they had expected”, with space for two single beds, two desks, a small fridge, a couple shelves and not much else – enough room to turn around and get dressed. The furnishings were perhaps a little underwhelming as well: older, a little tired and worn at the seams, so to speak. Alina thinks about it for a second and then says, in what turns out to be her characteristic poker face, that their first thought was “Are we going to live here? O-kay…”. Her drawn-out or cagey ‘okay’ makes Ieva smile and nod in agreement. “The leaflets that Charles University sent had a single picture. In the picture, there was new furniture, beautiful curtains. And when we opened the door here, it wasn’t as good!”. All the same, both make clear the initial impression didn’t last. As students in a foreign capital, I wonder whether they don’t spend most of their time away from the dorm anyway, making small negatives less of an issue. Ieva and Alina say that they actually spend quite a bit of time at the dorm, but also of course in class, seeing sites, or just meeting others around the city. One thing both agree on enthusiastically, is that the monthly rent is many times lower than what they would have to pay even sharing a flat with one or two others in Prague. Rents in the capital have jumped by as much as one-third compared to two or three years ago. They pay a little over 2,000 crowns a month each for lodgings here (around 100 euros, Ieva confirms), complete with services and good infrastructure (shopping, public transit), whereas in a flat they would pay at least three or four times as much. By any standard, life at the dorm is affordable. Foremost, other things far more important than having a new chair or curtains or a larger space. Ieva says, hands-down, the secret to having a great dorm life depends entirely on something else. Ieva in one of Větrník's renovated bathrooms. Photo: René Volfík. Perhaps the only thing that still irks Alina a little - actually she will not budge on the issue - is having to share the kitchen with others. (“My kitchen is mine. Period.”). I suggest cooking in a common area is at least a good chance to make friends, but both correct me that that it isn’t all it’s cracked up to be. Ieva says meeting others is fine but there are probably better ways than while waiting for a free stovetop or pot. Given the amount of time spent in the dorm after class, do Alina and Ieva ever fight? Not really, they insist. They have heard stories about others who didn’t get along, for example because one of the roommates snored. But my interviewees say they have no problem respecting each others’ personal space and the need to be quiet, for example, when studying. They say they get along just fine. Life in the dorm is not without occasional small problems that need attention, of course: a broken door handle or other things that need fixing from time to time; but local staff are on hand for exactly those reasons. If they missed anything in their room, the young women say, it was each having a personal lamp instead of having to rely on overhead fluorescent lighting. Speaking of missing, I learn during the visit that a laundry stand other students at the dorm had left out recently vanished. In the laundry room, the persons put up a “Missing” poster (which included a photo of the stand complete with drying clothes). Whether the stand disappeared with the clothes pictured or not, is not clear, but the stand at least appears to be irretrievably lost. Despite such negatives, Ieva sums up our meeting by saying she does not mind living in a dorm and Alina confirms they have had a great time. 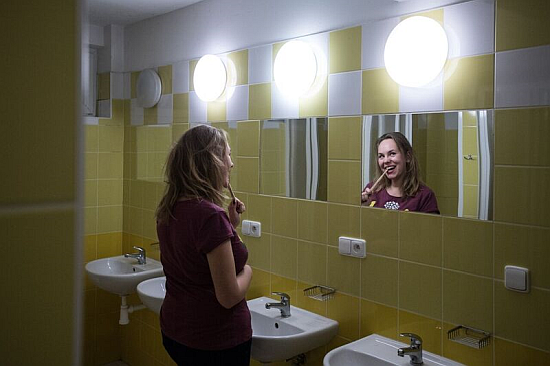 A dorm room for five years, though, Ieva’s reaction would be different. “One semester or two is an experience unlike any other” she says with a grin, “but any longer, maybe I’d reconsider”. Great roommate or not!